Former British foreign secretary Boris Johnson has urged Prime Minister Theresa May to use her crushing parliamentary defeat as leverage to get a better Brexit deal from European Union leaders. Johnson said Friday that May would be able to persuade EU leaders to substantially modify the withdrawal plan if she shows enough "gumption" in crisis EU talks. Jan. 23, 2013: British Prime Minister David Cameron promises a referendum on Britain's membership in the EU if the Conservative party is elected in the next general election. He does so to try to garner support among euro-skeptics within his own party. LONDON (AP) — She is a quiet, determined vicar's daughter who rose to the heights of British political power by outmaneuvering better known, more outspoken men. The favorites in a 2016 Conservative Party leadership competiton were Boris Johnson and Michael Gove. The winner was Theresa May, who became prime minister on a difficult mission to deliver Brexit. LONDON (AP) — A British parliamentary committee reprimanded former Foreign Secretary Boris Johnson on Thursday for failing to report income within time limits set by Parliament. Johnson has acknowledged his mistake and taken steps to prevent it from recurring, the committee said. Johnson was found to have failed to make timely income reports on nine recent occasions. The amount involved totaled more than 52,700 pounds ($67,000). LONDON (AP) — London Mayor Sadiq Khan says three used water cannons bought for police under predecessor Boris Johnson have been sold for scrap, at a loss of more than 300,000 pounds ($385,000). LONDON (AP) — A minister in the British government stepped down Friday to protest Prime Minister Theresa May's Brexit plan and is backing calls for a second referendum on whether the country should leave the European Union. BRUSSELS (AP) — British Prime Minister Theresa May will head home from an inconclusive European Union summit on Brexit to a barrage of criticism that her 27 EU counterparts spared her during the two-day event that ended Thursday..
LONDON (AP) — Britain's former ambassador to the European Union has called Prime Minister Theresa May's blueprint for Brexit a "pipe dream" that has no chance of being accepted by the bloc. As May prepared to update key Cabinet ministers on progress toward a deal, Ivan Rogers said that, more than two years after voting to leave the EU, Britain is "on fantasy island" about what kind of divorce agreement is possible. BIRMINGHAM, England (AP) — British Prime Minister Theresa May battled to unite her Conservative Party on Wednesday, telling critics to abandon their dreams of a "perfect" Brexit and "come together" as divorce negotiations with the European Union enter their tough final phase. May took on her detractors in a punchy address to the party's annual conference, a day after a rival, former Foreign Secretary Boris Johnson, challenged her authority with a crowd-pleasing speech of his own. 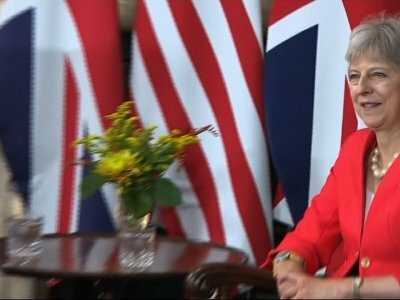 BIRMINGHAM, England (AP) — Prime Minister Theresa May will urge her fractured Conservative Party on Wednesday to unite behind "decent, moderate and patriotic" policies, a day after her rival Boris Johnson trashed her Brexit plan and challenged her authority with a crowd-pleasing speech of his own. BIRMINGHAM, England (AP) — Former Foreign Secretary Boris Johnson revved up Britain's Conservative Party Tuesday and ramped up pressure on Prime Minister Theresa May, condemning her proposed divorce deal with the European Union as a "cheat" that would keep the country manacled to the bloc. LONDON (AP) — Ex-Foreign Secretary Boris Johnson has branded British Prime Minister Theresa May's plan for leaving the European Union "deranged," fueling tensions as the ruling Conservative Party holds its annual conference. Johnson told the Sunday Times that May's Brexit plan won't work, particularly proposals that would require Britain and the EU to collect each other's tariffs. LONDON (AP) — Former British Foreign Secretary Boris Johnson said Friday that Prime Minister Theresa May's blueprint for Brexit would be a "political and economic disaster" and he refused to rule out trying to replace her. Johnson quit the government in July, citing his opposition to the prime minister's plan for close regulatory and economic ties with the European Union after Britain's departure. LONDON (AP) — Leading Brexit-supporting lawmakers insisted Wednesday that they aren't about to topple Prime Minister Theresa May, despite strong opposition to her plan for taking Britain out of the European Union. A faction of May's Conservative Party opposes her proposal to keep the U.K. aligned to EU rules after Brexit in return for free trade in goods. They say that would keep Britain tethered to the bloc and unable to strike new trade deals around the world. Johnson and Marina Wheeler said in a joint statement Friday that they separated "several months ago" after 25 years of marriage and have now decided to divorce. The couple said divorce proceedings are now underway. LONDON (AP) — British Prime Minister Theresa May's brief summer holiday from Brexit battles came to a noisy end Monday, as she faced attack from both sides of her divided Conservative Party. Archrival Boris Johnson inflamed speculation that he aims to oust May by branding her plan for Brexit "a disaster." LONDON (AP) — Republican strategist Steve Bannon weighed into British politics Sunday in a wide-ranging interview in which he defended former Foreign Secretary Boris Johnson's comments about Muslim face veils and praised a controversial British far-right leader. LONDON (AP) — Former British Foreign Secretary Boris Johnson is facing a Conservative Party investigation over a column comparing women who wear face-covering veils to mailboxes and bank robbers. The party has received complaints that the comments breach its code of conduct, and under Conservative rules they must be investigated by an independent panel. Possible penalties include expulsion from the party. LONDON (AP) — British Prime Minister Theresa May and other senior Conservatives told former Foreign Secretary Boris Johnson to say sorry Tuesday for a newspaper column in which he wrote that burqa-wearing women looked like "letter boxes" and bank robbers. PARIS (AP) — French Foreign Minister Jean-Yves le Drian and his newly-appointed British counterpart, Jeremy Hunt, are holding their first working meeting in Paris. Brexit negotiations are high on the agenda Tuesday for Hunt, who later heads to Austria to convince European counterparts to engage with British proposals for a deal. LONDON (AP) — Former U.K. Foreign Secretary Boris Johnson implored fellow lawmakers Wednesday not to abandon Brexit, urging them to remember the initial enthusiasm surrounding a complete break from the European Union. In remarks to the House of Commons, Johnson criticized Prime Minister Theresa May's plans for exiting the EU, describing it as a clean departure "in name only." Britons should be "great independent actors" on the world stage, not "rule takers," he said. Former UK Foreign Secretary Boris Johnson implored fellow lawmakers not to abandon Brexit, urging them to remember the initial enthusiasm for a sharp break from the European Union. LONDON (AP) — Britain has had a sharp lesson in dealing with U.S. President Donald Trump's appetite for disruption. The British pound fell, then rallied, and U.K. politicians reeled, then steadied as Trump showered praise on Prime Minister Theresa May on Friday — hours after an interview in which he criticized her, praised a rival and gave her hard-won Brexit roadmap a battering. U.S. President Donald Trump says he thinks former British Foreign Secretary Boris Johnson would make an "excellent" prime minister. The comment was published in The Sun newspaper on Thursday night as Trump was leaving a black-tie gala hosted by current British Prime Minister Theresa May during Trump's maiden visit to the U.K. as president. LONDON (AP) — Diplomats and politicians around the world were bidding a not-always fond farewell Tuesday to Boris Johnson after the blond foreign secretary's bombshell resignation. Australian Foreign Minister Julie Bishop said her government would "miss Boris." But John McKendrick, attorney-general of the British overseas territory of Anguilla, called Johnson "the worst Foreign Secretary we've ever had." British Prime Minister Theresa May has named Jeremy Hunt to the job of foreign secretary after the resignation of Boris Johnson. May's government was rocked Monday by the resignations of Johnson and Brexit Secretary David Davis. They quit amid divisions in the government over Brexit. Foreign Secretary Boris Johnson quit with a resignation letter accusing May of flying "white flags" of surrender in negotiations with the European Union. He said "the Brexit dream is dying, suffocated by needless self doubt "
LONDON (AP) — The bombastic Boris Johnson is out as foreign secretary, but few if any suggest Monday's resignation means the last has been heard from one of the best known figures in British politics. COPENHAGEN, Denmark (AP) — Denmark's Prime Minister Lars Loekke Rasmussen urged Wednesday his Ukrainian counterpart to speed up reforms at home because some "are moving forward at snail's pace," as European and Canadian officials met at an international conference to discuss reforms in Ukraine. Loekke Rasmussen told Ukraine Prime Minister Volodymyr Groysman "hard work still remains," adding further political and economic reforms are "Ukraine's ticket to freedom and long term stability."